Or, to paraphrase in non-neuroscience jargon: When your environment is cluttered, the chaos restricts your ability to focus. The clutter also limits your brain’s ability to process information. Clutter makes you distracted and unable to process information as well as you do in an uncluttered, organized, and serene environment. The clutter competes for your attention in the same way a toddler might stand next to you annoyingly repeating, “candy, candy, candy, candy, I want candy, candy, candy, candy, candy, candy, candy, candy, candy, candy …” Even though you might be able to focus a little, you’re still aware that a screaming toddler is also vying for your attention. The annoyance also wears down your mental resources and you’re more likely to become frustrated. The researchers used functional magnetic resonance imaging (fMRI) and other physiological measurement tools to map the brain’s responses to organized and disorganized stimuli and to monitor task performance. The conclusions were strong — if you want to focus to the best of your ability and process information as effectively as possible, you need to clear the clutter from your home and work environment. 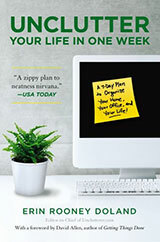 This research shows that you will be less irritable, more productive, distracted less often, and able to process information better with an uncluttered and organized home and office. If you don’t subscribe to The Journal of Neuroscience, I recommend heading to your local library to read the full article. Also, thanks to the reader who brought this research to our attention. Great post. I see this amplified in my ADD-daughter’s world. If her room is cluttered (which it usually is – she can’t bear to part with anything), she has a much harder time doing “basic” things like getting ready for school, putting things away, etc. Most people are perfectly capable of “tuning out” a static and habitual physical environment. If I do my work in a space that I use routinely, the competing stimuli will naturally fade away. It’s only if the competing environment is either dynamic or novel that this condition poses a problem. Trying to write in front of a window facing a gorgeous mountain vista becomes commonplace. But try writing in front of a window facing a heaving and ever changing downtown street. Much more difficult. Haven’t you ever taken a train or bus through a breathtaking part of the world surrounded by locals? They’re either sleeping, talking to one another, or busying themselves in some personal way–while I’m cranking my neck in every direction gulping in the scenery. Get ready for everybody to say that THEY aren’t affected by clutter. I’d be interested to know what kind of clutter issues the test subjects had and whether they tested pictures/environments of clutter that were impersonal. My cluttered desk doesn’t affect me the same as looking at some one else’s cluttered desk. A hoarder will not have a problem throwing out other people’s things, but have huge difficulty in letting go of the smallest insignificant item that belongs to them. >>My cluttered desk doesn’t affect me the same as looking at some one else’s cluttered desk. How do you know your focus, concentration and energy levels wouldn’t be better with a declutered, tidy desk? Just seems common sense to make things easier on the brain. Science is finally figuring out what Feng Shui (and common sense) has advocated for centuries. It’s funny how slow sciece can be. Everyone here is tidy but me. I’m very messy and I don’t know how to change. My dad is very tidy, but my mom and my sister aren’t. Living with them it’s very complicated, and I should get a place for my one, but at the moment I don’t have the money. I can’t change the sistem at home. For example, my family went on holiday this weekend and I stayed home. I got very stressed trying to unclutter the most. But they arrive yesterday and leave all their stuff around. Goodbye to everything i did. What can I do? I didn’t say that it didn’t affect me, just that I am affected differently by messes not made by me. Hypocritical? Probably. Interesting neurologically/psychologically? Definitely. Just interested in why emotional/personal attachment to clutter makes a difference in perceived response. @L — They didn’t test with photographs of offices or desks. They used a series of shapes and data. The findings of the research go well beyond just clutter. I recommend looking at the original article to see the examples of the tests. @Tim — They said trying to focus/concentrate more intently on an object does not improve your your overall ability to ignore the clutter. I’m not 100% certain this relates to what you were saying, but I think the original article might do it better than I just did. @Erin So data no personal/emotional attachment to the shapes. Interesting. I will check it out. ok ok- I’ll clean the garage/family room/homeschooling room ! I guess this explains why I always had to clear my desk before I started writing papers in college and grad school. I am working on my site right now but I have been advocating forever that a messy, cluttered surrounding means a messy, cluttered mind. I cannot stand clutter. I cannot focus in clutter. Just the time you save by being able to find what you need when you need it is worth xing the clutter. My mother always said “find a place for everything and when you finish using something put it in it’s place.” Very Simple….You never have to clean up a big mess if you live this way..
I’ll file this under “interesting” at best. The research only recognized clutter’s impact on brain functionality (which is true), but failed to recognize the genesis of the cluttered space and its connection to human feelings (which is also true). Just the thought of the toddler standing there saying candy repeatedly was distracting and irritating to me, lol! But it was a great way to explain it! I think that in general, people are this way, but of course there are differences that abound! I have always felt that clutter makes me feel chaotic . . . I sold my large home (of 22 years) on 5 1/2 acres a couple years ago. The Realtors told me that nearly everyone commented on how serene and calm the home made them feel. Several said the property was too much to keep up with but that they were going to declutter there house because they loved the open feeling of our home. I continue to hear this when people come into our new home. We downsized to half the living space and no property so it was VERY challenging to say the least. I think the happiest I felt is when I was building my home and lived on the property in a 29′ travel trailer. Life was simple, living was cheap! I only skimmed over the article, but I’d be very careful about drawing conclusions like this. From the quote you’ve included, it’s only saying that clutter reduces brain activation. But brain activation by no means implies a greater ability to focus. Sometimes it means the opposite. Do the authors present any behavioral data to support the “clutter hurts performance” position? And it’s an even greater leap beyond that to go from “visual clutter on a computer screen will reduce your brain activation in visual areas” to “removing visual clutter in real life will make you less irritable, more productive, distracted less often, and able to process information better .” I don’t see anything in this study regarding about the emotional impact of clutter at all. That’s a completely different ballgamae. If I have missed this in the paper, please let me know. Personally, I find this to be very true. I can’t do “real” work (as in writing and editing) when there are tons of papers and items around me. I clear the decks. I can, however, do phone calls and even some detailed online work with paper clutter around me. Meanwhile, I’ve worked with people whose desks and office space were a literal nightmare (it looked as if file cabinets had exploded) but the people were organized, met deadlines, could find anything. I’ve worked in the same companies with people whose desks, office space were immaculate and seemingly organized. They missed deadlines, were lousy with details and could not easily find things. AND…they spent more time organizing than working! It’s all individual, regardless of studies. @Kimberley: I think most people have figured out that clutter is not helpful. It’s not that science has just worked it out, it’s showing what the underlying neural reasons are. Feng Shui just demonstrates how you can open your wallet to a con artist for little benefit. I can unclutter all I want, but the toddler will still be standing next to me saying “candy, candy, candy, candy.” Some days I think it is a losing battle. I find this article to be very true of myself. 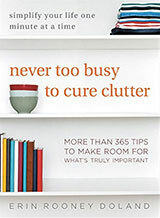 It is a great article for hoarders and messies to read. It sure hit home here. I agree with Livia’s comments. I personally conduct this type of behavior research and collaborate with researchers cited in the references. The type of attentional focus we study is very different from the type of focus described in the post. As such, to derive the implications mentioned in the post is really a stretch. As a Professional Organizer for 12 years, I have seen how removing clutter can change peoples lives. Sorting, simplifying and clearing out what does not serve you today brings a balance to your environment and more time in your life! I completely agree about clearing out clutter. My desk is always a reminder of projects and things left undone. It ALL distracts me in a major way. Even the presence of the scanner reminds me of the slides that I need to scan, the family history project to write about the people IN the slides and the trip I need to organize in order to visit the family out of state. And that is just the scanner! Having the computer monitor on the desk reminds me of the files I need to update, or the lessons I need to plan and the mail I need to answer. I keep a monthly calendar on the wall, and although I don’t write on it, it reminds me of more planning, commitments, and Stuff to Do. Is there no hope for my distractible brain? Give me a blank piece of paper to do a task in an empty room and I’ll immediately begin making a list on the back of all the other things I need to be doing besides the task at hand. Now if Vincent had left the canvas blank just think about how thought provoking, evocative that would have been. Looking at stuff keeps you awake during boring __________. I leave stuff out because I am a visual learner, visual clues that remind me. Have you ever seen a photo of Einstein’s desk??? Thank you, thank you, thank you for this article and comments!!! I am on day 35 of my 100 day challenge to “Clear the CRAP” from my surroundings and my mind. I’m in a stage of transition in my life and I believe I’m not going to effectively find direction until I clear out all my Crap – well, “Clutter”, if you want to be politically correct, but I reckon a lot of the stuff we have around us and within us can easily be classified as unnecessary crap! Love your comment Randy Barnes, and good point Ken. These are just some of the obvious statements from the study. Do you disagree with these findings? They seem pretty darn straightforward (well, as far as neuroscience jargon is concerned). Whether or not we believe that the ideas presented apply to us personally, I think there is benefit for those whose space we use every day to at least consider how it affects other people. Case in point – I teach in an elementary school with 22 classroom teachers. There is one classroom in particular that is filled to the brim with piles of papers, outdated materials, twenty years of accumulated trash and supplies. Students who learn in this room are equally untidy, lose their assignments and are constantly being reprimanded by their teacher for tiny infractions. Clearly not a happy space – perhaps decluttering would help… possibly not. I know that I would not be able to funtion as a student in that room. Similarly I find that beautifully decorated classrooms are just as difficult to work in. The posters on the wall, bright colors on everything and items hanging from the ceiling just put me in a distracted mood. Eventually this may become background, but for some (our ever growing ADD population for instance) it is always present. I aim to create an atmosphere in my classroom, which is also my office, that is a nice balance between stimulating, motivating and relaxing. I ask for input from others (students and teachers) regularly and hope to create a space that is conducive to learning. Though I have never really thought about it, I suppose that I strive for the same feeling in my home. For me, it’s a fine balance. Often it’s “out of sight, out of mind” and then I don’t get things done. On the other hand, having too many things out leads to not getting things done due to indecision on where to start or guilt about letting so much pile up. But as for ability to focus once I get started on the task, yes I do better without too many other items sitting around screeching “work on me! work on me!”. @JustGail and others who commented they leave things out to remember doing them- I used to be like this without realizing it, the trick to getting past this is writing it down. I am more attached to my To Do notebook now and feel much more free without the need to make sure my half completed project stays on my desk so I can finish it. I realized a similar thing was happening to me, only instead of clutter distracting me, it was ugly things in my peripheral vision at work making me grumpy!!! A trip to Target and playing around in Photoshop helped me to fix the problem! So back to my original thought – this is interesting, but not life changing research. Like I always advocate – unless you have a solution, don’t tell me the problem! They have the solution – clean/tidy up. Unthinkable? This IS life changing for me. I can’t work with clutter – both from the distraction and the irritation of having to look for things lost in the clutter. I’ve been madly decluttering since reading the article. It’s been the most motivating of anything i’ve read. The article should give everyone something to think about and then see if they work better with less clutter, acknowledging that there are different kinds of people, work, and clutter and no one answer fits everyone. Trying working with less clutter is a small price to pay for to see if it improves your performance, and if decluttering doesn’t help, there’s no need to continue. Karen – I’ve read that children with ADD work better in classrooms where there is not as much visual distraction from lots of decorations, papers, and projects on the walls. That’s the way most grade school classrooms look and many kids find it cheerful and stimulating. Could her work at school be affected by how her classroom looks? Andy – have you tried http://www.flylady.com ? it might help you keep your own things under control and possibly inspire your family to try some of the techniques when they see how well they work for you. @Erin — The statements in quote are from this paper but they need to be interpreted within the context. The context is here is visual selective attention, namely how we pay attention visually to some things in the environment and not others. This paper, and also the domain of research, studies the ability to focus attention on selected visual stimuli, whereas the focus you referred to in your post, and in most of the responses here, is more akin to concentration on thoughts and tasks. The is also the difference in scale to consider. In the study all of the stimuli were contained within a 36×28 visual angle area. That’s probably the size of a large flat screen TV viewed from a very close distance. The clutter in the environment certainly comes in far larger scales, to the point that they won’t all be contained in one view as in the study here. It’s an open question when the type of clutter they studied is placed way outside of the viewing range, whether it would still have the same effect. It is one thing to find inspirations on real life problems from research findings knowing that the context of the study is quite different. It is another to draw implications far beyond the scope of the study, like when you wrote “This research shows that you will be less irritable, more productive, distracted less often, and able to process information better with an uncluttered and organized home and office”. That’s what I and Livia disagreed on. Most desks are 36″ wide and about 24″ deep. A desk in a cubical is usually even smaller. It sounds exactly like the test range in the study. Why would a desk not apply? Would a monitor screen, cluttered with icons and multiple open windows, also be out of visual range? Weren’t the test images actually shown on a monitor? How can it not apply if it’s the same way the test was administered? The conclusion that you can process information better when it is organized is based on the statement in the study: “These results suggest that perceptual groups or candidate objects receive an advantage over unorganized elements (McMains and Kastner, 2010).” Advantage, at least in my understanding, means better. So, if you can process organized objects better than disorganized objects, why is the statement “you are able to process information better with an uncluttered and organized home and office” not accurate? As you move through your home and office, wouldn’t your surroundings come into your visual range in 36″ x 24″ groups? Why can’t things you see be considered? I thought the entire purpose of the study was to look at visual cortex processing. Had I said “desk” or “computer monitor” would you have less of an issue with my interpretation? Like I said, I’m not trying to be confrontational, I’m just looking for further explanation. It this is true, then any engagement in a natural setting, say a forest, or even a tree filled with the clutter of uncountable leaves would make us distracted and unable to focus. This means that all those people who find a walk in the woods, calming and peaceful are so over stimulated that they have become anesthetized to the clutter that is evident in any real forest. Just think about the clutter of a seaside (that is not simply a sand beach) or all those constant waves and wavelets that make up the rythm of the surf. I suppose that is why people have flocked to live in urban environments to get away from the unmanagable clutter of the rural wilderness. While I am a meditator and appreciate the Zen of simplicity – the real world is ALIVE because of its turbulence of change and detail. Life by definition is ‘messy’ uncontrolled and un-ordered. The drive to impose human-made order everywhere is perhaps an unnatural pathology – more a death wish than an embracing of life. @Erin — There is one critical difference to consider between the type of perceptual organization used in the study and what we consider as organization in an uncluttered environment. Take this study for example. The way it found results to support conclusions like “perceptual groups or candidate objects receive an advantage over unorganized elements” was in part by comparing performance on trials with a “neat” stimulus in the periphery and that on trials with a “cluttered” stimulus in the periphery. Note that the specific neat stimulus shown changed from trial to trial, so did the cluttered stimulus. How likely is it for the clutter in our environment to change every second or so? To more closely approximate the type of clutter we find in our environments, this study would have to repeat the same “cluttered” stimulus over and over, and compare the performance to that on trials with a repeated “neat” stimulus. I personally would very doubt that they would find the same effect but that’s another open question. None of my comments is meant to suggest that there is no relation between the organization of our environment and our ability to process information. I simply want to point out the differences between what the study is about and what we would like to believe as the relation between an uncluttered environment and our ability to process information in it. The discrepancies are simply too great for me to use findings from this study as support for what we would like to believe. Usually, I find my apartment a mess when I am mentally distracted or overwhlemed. I am trying to declutter at the moment, BUT–I always did my homework in places like the cafeteria, not the library….I work better when I can zero in on something in a busy environment, not a dull environment that has me looking around for stimulus…..
@Erin – Thanks for being receptive to feedback. It’s always nice to see open minded bloggers. Swu raises some good points. I also work in the field. While my dissertation research is on the neural imaging of reading acquisition, I spent a year after my undergrad in a visual attention lab doing similar research. The problem is that you’re taking statements from the paper, which use scientific terms in a very focused way, and generalizing them to other definitions that do not hold. “Advantage”, as you mention in a previous comment could possibly mean better (although it’s not the best term). But the “better” they mean has nothing to do with being more productive or less irritable. There’s simply nothing in the experiment that has anything to do with that. Just look at their methods. They don’t measure productivity, they don’t measure mood. Their experiment isn’t even about the effect of clutter on productivity. They’re looking at bottom up and top down processes and attentional modulation. Perhaps a more intuitive way of explaining this is not to look at quotes from the very jargon-heavy paper (I’m actually impressed that you read it at all. I’ve been reading this literature for years, and I’d still need a few hours to even make sense of their experiment), but to look at what the experimenters actually did. They are looking at brain activity while subjects are doing one very focused, simple, and artificial task on a computer screen, focusing on what their visual systems are doing. Just intuitively, that is nothing like the complex tasks we do in real life. It’s like taking strategies for reading an eyechart at the doctor’s office and saying those same strategies will make you better at calculus. Apples and oranges, even though they both require eyes. As a neuroscientist, I’m very glad to see bloggers with interest in the field, and I’m glad you’re open to discussion on the topic. It’s just that we have to be very cautious about drawing conclusions. Your conclusions from the paper might well be true, but we wouldn’t know for certain unless we actually do that experiment. This is pure pseudoscience of which every academic should be ashamed of. Besides the obvious (yes we can concentrate better when there isn’t a screaming child in our ear) there are countless examples of creativity coming from chaos. Einstein, for instance was notoriously cluttered. And often breakthroughs come when you’re in a heightened state of activity and unrest. Princeton should aim higher. good information. i’m of the cluttered environment tendency. the ability other than focus, almost an opposite one in a way, is that of creativity, which might in fact be enhanced by clutter, and disenhanced (a word?) by order. it’d be interesting to see a study addressing this. or… if anyone knows of one, appreciate being directed to it. swu and Livia have already done a good job of pointing out the inappropriateness of drawing out too many real-world conclusions from this research, so I won’t bother joining in with that. Instead I will direct your attention to this book which tries to explore some of the benefits as well as the dangers of messiness. I would recommend it to any declutterer if you actually want to understand your messy clients rather than just expecting them to become versions of yourself and running the risk of inducing guilt when they inevitably fail to live up to the standards you maintain naturally.